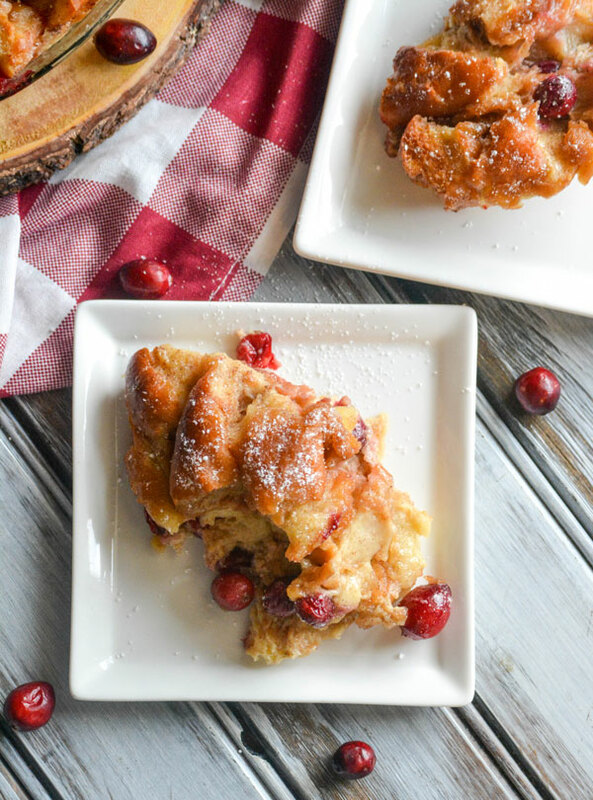 Quick & easy, but holiday themed, this Cranberry Donut Bread Pudding is just what the chef ordered. 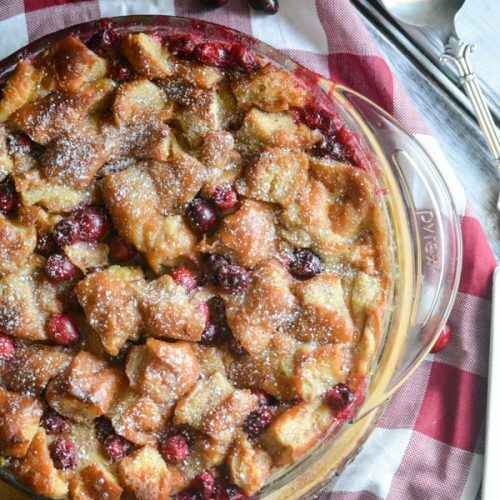 It’s an easy breakfast or brunch, and your family would be hard pressed to believe you that it’s studded with seasonal favorites. 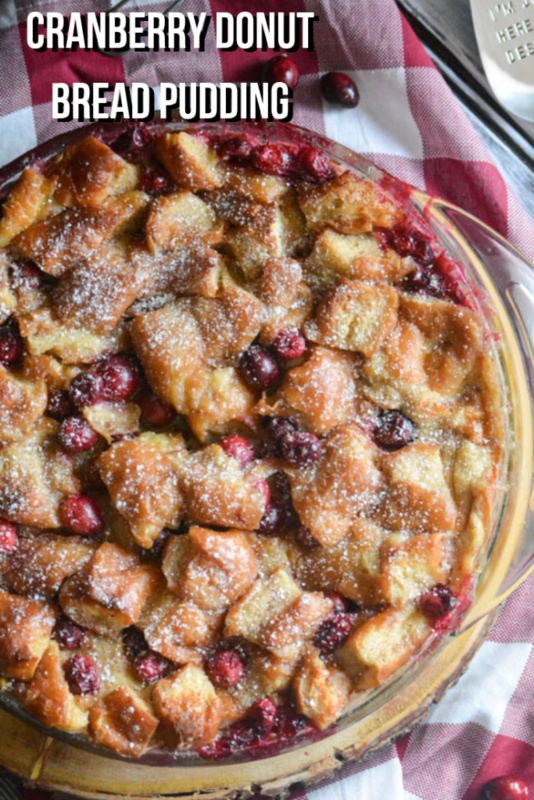 Cranberries are finally in season again. I wait all year for this. Luckily, they also freeze really well. So I grabbed several bags last weekend at Costco. I put three in the freezer, and stuck one in the fridge. All the things cranberry are coming my kids’ way. They’d better batten down the hatches and prepare. Luckily for me, this year I won’t be beholden to just the season to enjoy the fruit and all the tasty treats I can add it into. It also may be a bit cliche, but my husband is the epitome of the Dad who brings donuts home for breakfast every Saturday & Sunday. He doesn’t actually always bring those glorious fried pastries home, or even go out. But here is an unwritten rule in our home, that while dinner is my deal- breakfast is his. Some weekends, most if I’m being honest, he gets up and cooks a real feast. Eggs, hash browns, some kind of meat, toast- the works! While I’m not a real breakfast person, or morning person in general any day of the week, I do enjoy his effort. The kids do too! Those mornings he doesn’t feel like cooking? Or those days where the family needs a little pick me up? He goes and then he delivers when he comes home. He brings Krispy Kreme donuts home. And who doesn’t love those?? I sure do. Gosh, how do I even manage to stop at just one? Those suckers are finger licking’ good, and hard to resist. Just to make this recipe, I had to threaten all my guys with no cooking’ from Mama for a week if they touched the extra batch of donuts I’d bribed the Hubs to bring home. I’m the kinda mean Mom to back it up too. I needed those donuts for a very special reason. So that I could leave them out on the counter for 2-3 days and let them get stale. Yes, I know that sounds a tad bit crazy. I mean who lets perfectly good donuts sit out and ‘go bad’ as my kids put it, when there’s a hungry crowd ready to chow down. Me, I guess. I did try to reassure them that there patience and fortitude would actually pay off, with something much yummier as a result. They weren’t sold, all those with little confidence in me and my culinary wiles. So, stave off your hungry hoard- let them know those donuts are off limits. Severe consequences will be considered if they touch them. We want them to get stale. You can choose to leave them whole for this, but I suggest chopping them up first, since they will get stale quicker. In a large mixing bowl, all of the liquid ingredients are whisked together vigorously, even the sugar, until they’re evenly combined. 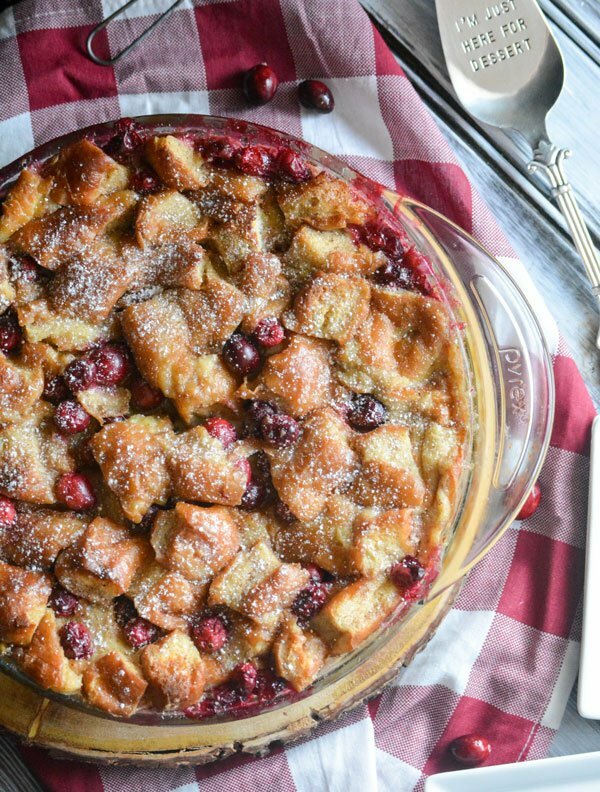 The chopped, stale donuts are tossed together with the fresh cranberries and then pressed into a greased pie dish. Pressed in firmly too, it will be a tight (but delicious) fit. 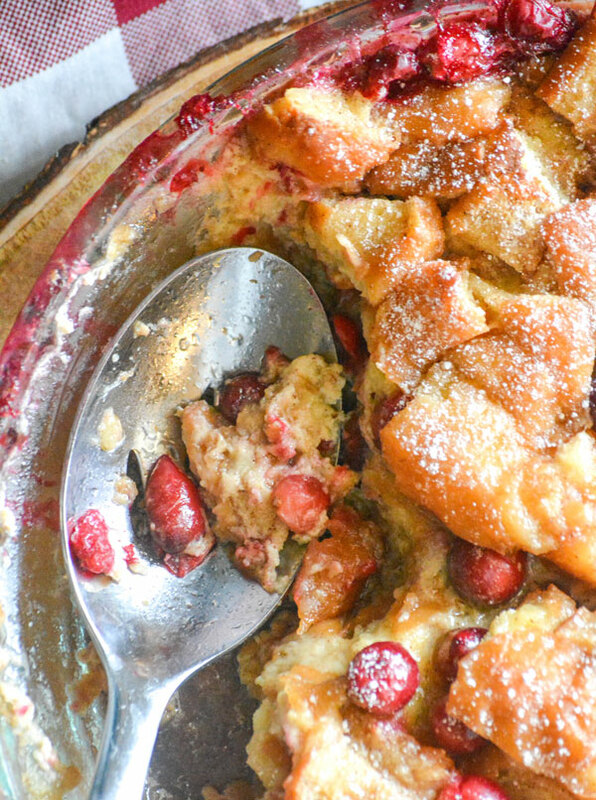 The egg mixture is poured out over top, the Cranberry Donut Bread Pudding. The dish is baked at 325 degrees for 55-70 minutes, until it’s golden brown & puffy on top- but set in the middle, even if it’s a bit jiggly still. Dusted with powdered sugar before hand, it’s a true sweet treat. 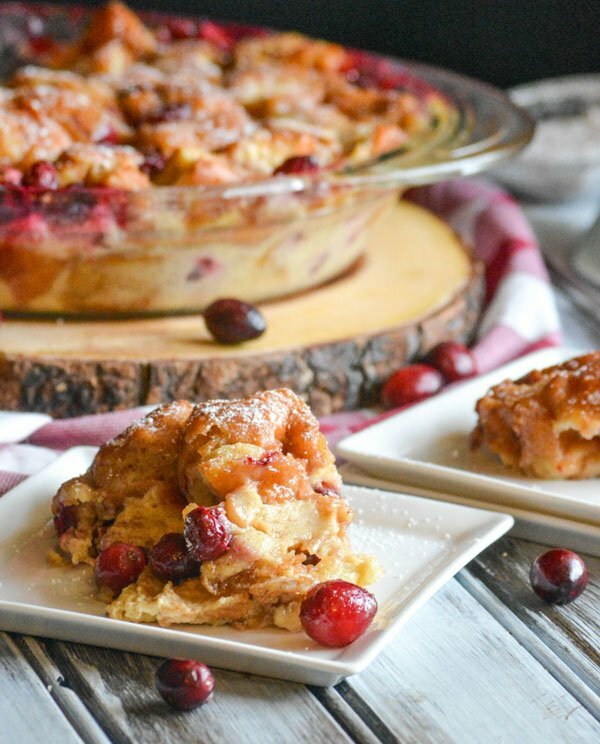 Whatever you’re feeling, don’t question this Cranberry Donut Bread Pudding. It’s a born to be family favorite, perfect for holiday occasions. 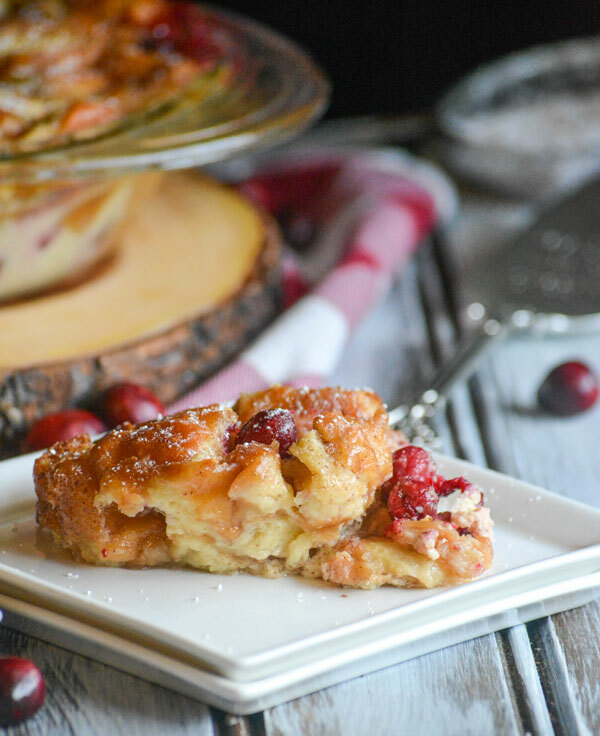 Bread pudding has never been yummier than with this version that features fresh cranberries, chopped glazed donuts, and a bit of eggnog in a holiday dish topped with a finish of powdered sugar. In a large mixing bowl, whisk the eggs until beaten. Whisk in the eggnog, butter, vanilla, and nutmeg. Whisk in the sugar, stirring until completely dissolved. In a separate bowl, add chopped donuts & cranberries, gently tossing until combined. Liberally butter a 9" pie dish. Transfer the donut and cranberry mixture to the greased dish. Arrange so they're evenly dispersed, and securely in the dish. It will be a tight fit. Pour the egg mixture evenly out over the donuts, and used the back of a spatula to gently press down on the donuts to help them absorb the liquid. Place a buttered piece of foil ontop of the dish, and press around the edges to seal/secure it. Refrigerate the dish for at least an hour, but up to overnight while the pastry soaks up the custard mixture. Preheat the oven to 325 degrees, and allow the dish to rest on the counter top while doing so. Place a cake pan, full of water, on a lower shelf in the oven. Bake the bread pudding on a shelf above it for 55-70 minutes, removing the foil after the first 40. Bake until the dish is golden brown all over, puffy on top, and the mixture's set in the middle but still bit jiggly. Remove the dish from the oven, and allow it to rest for a full 30 minutes before scooping and serving. Dust either the whole dish, or individual servings, with powdered sugar just before serving. 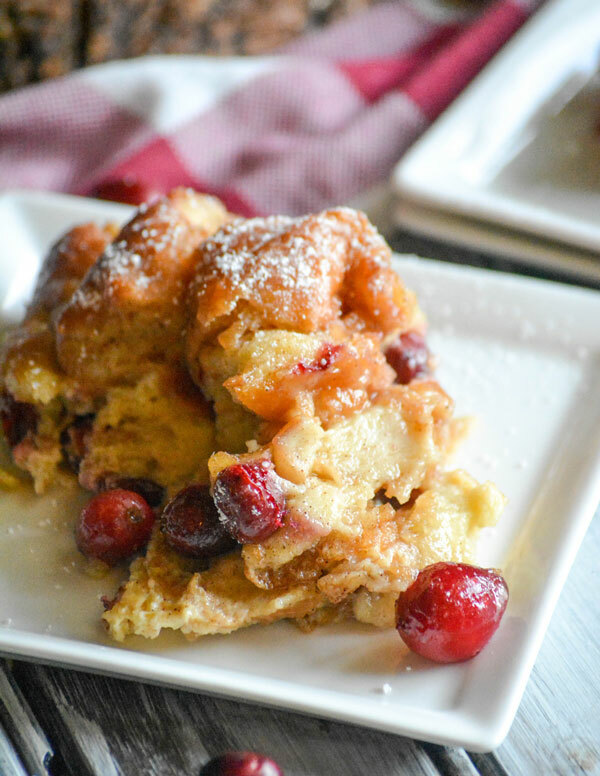 I make this also with Krispy Kreme donuts but the cranberries are a nice seasonal touch. Happy FF!